Uwe Rosenberg is known for excellent card games like "Bohnanza" and its variants or "Mamma Mia!" and "Sole Mio". These games have in common that they are set collection games combined with a portion of memory mechanic. The designer's latest offering continues this pattern. This time the setting is in the county of Nottinghamshire, where the Sheriff's deputies are tasked to collect overdue taxes to raise money to support the Sheriff's re-election. The deputies are represented by the players, whose task it is to collect sets of identical cards of the seven different kinds of valuables. On their turn players draw one card from a face down draw pile and reveal it to all players. They may then add the card to their hand cards. If they now have three or more cards of the same kind in their hand, they may place these openly in front of them to score victory points. Alternatively, players may collect cards to fulfil special assignments. These range from collecting three or four pairs or five of a kind to one of each kind. Fulfilling such a task is again performed by playing the card openly in front and collecting the assignments victory point allotment. Except for laying an ambush all action result in receiving one or two cards from a player in return for the card just drawn from the pile. 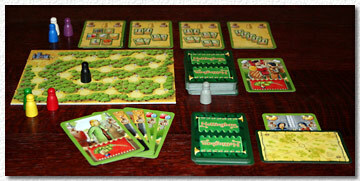 The ambush is the special case of a "delayed" theft, which can be executed when another player plays a collected set. In this case one of the set's cards is exchanged for the card with the ambush ability thereby possibly destroying the set. A good memory helps in playing the game as all cards except the initial three hand cards any cards drawn from a player's hand are known to all players. So keeping track of the cards in the other player's hands helps a lot in deciding whether it is worthwhile to use a card's special ability and if so, against which player. My experience with the game varied considerably depending on the group of players I played with. Played with a group of experienced gamers the game had little to none player interaction in terms of communication. Game play was rather mechanically and repetitive as the options a player had or decisions to take were all too obvious to generate any real challenges. One's turn boiled down to deciding on the best possible move to make based on the card just drawn and the knowledge of the other players' hand cards. With some players this may even cause the game to drag. Obviously, the luck of the drawn plays a considerable role here. The scene changed completely when I played the game with a group of teenagers. Here the interaction between the players was pretty high most of the time, mainly because of regular "take that!" attempts towards the assumed leader. Pondering about the best possible move was much more seldom, which sped up the game considerably. 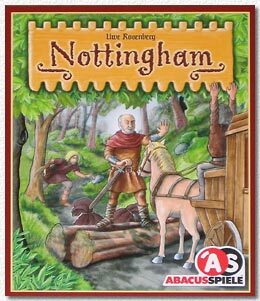 Overall, "Nottingham" does not offer the qualities of earlier Rosenberg games in terms of replay value. Seasoned gamers will find it rather uninspiring, while occasional gamers may find it too much dependent on the luck of the draw.